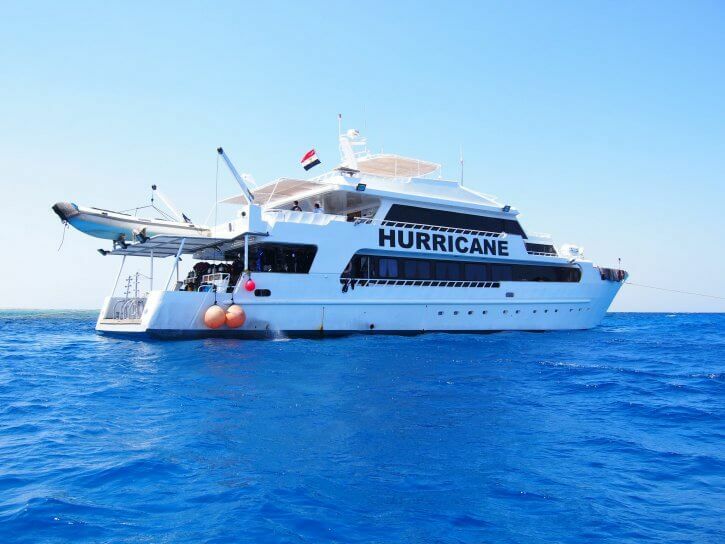 Hurricane our home for the week is the perfect boat for the southern Red Sea. 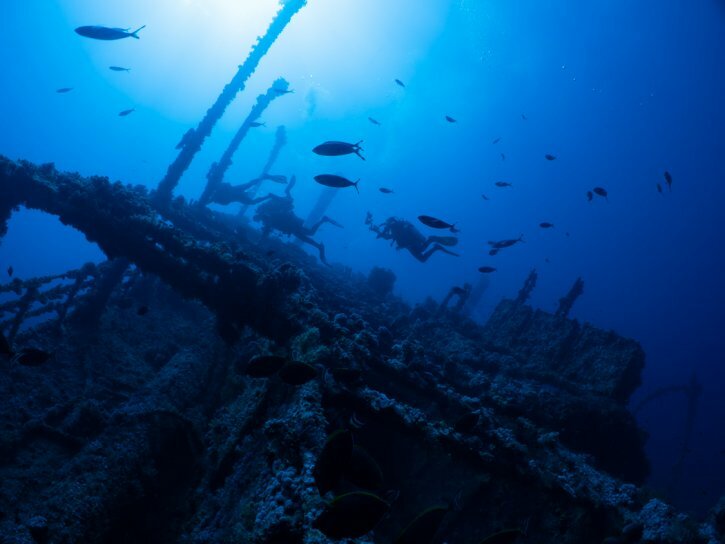 Her Steel hull and great design make her a very stable platform to dive from. 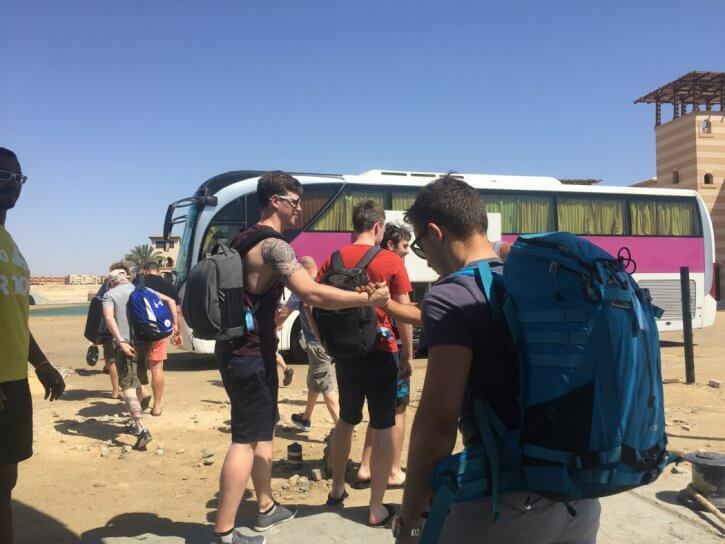 The direct flight to Marsa Alam is a blessing, the airport is located just 15 minutes away from the marina where Hurricane makes port and the Scuba Travel rep was waiting for us on the airside to assist everyone with the immigration process. This meant we didn’t have to queue to sort out our visas. Once everyone got their luggage we were taken to the harbour where the boat crew was waiting for us. They did take care of offloading our bags while we were shown to the saloon where a quick refreshment was served while our guides gave us the welcome briefing and checked us in. After setting up our gear we had our dinner and relaxed on the top deck. Hurricane is an amazing liveaboard. She’s not the newest boat in the Red Sea but I think is by far the most stable and the crew is fantastic. these guys have been working together for almost a decade and it shows it. They are a well-oiled machine always with a smile. She just came out from the dry dock after a huge refit, and she looks amazing and is very comfortable. Reda, the chef is excellent and made sure we were very well fed the whole week. He’s an important person on the crew to get to know! I did this trip at almost the same time last year, and then it had been all about hammerheads and mantas. This year, mother nature showed us who is boss! 2018 was all about oceanics. But they did require a different take to the photography. Luckily, my years as a dive guide meant we could adapt quickly and easily to get the shots. 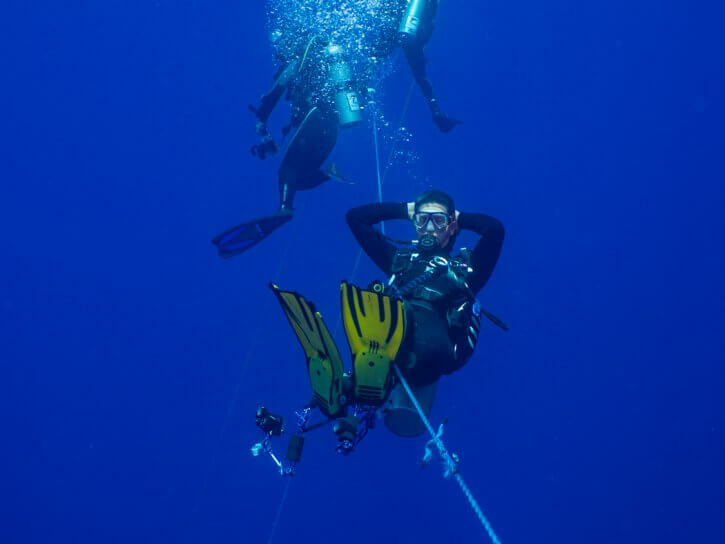 On a trip such as this, the subject behaviour and the general nature of the diving make it almost impossible to offer much in-water assistance. 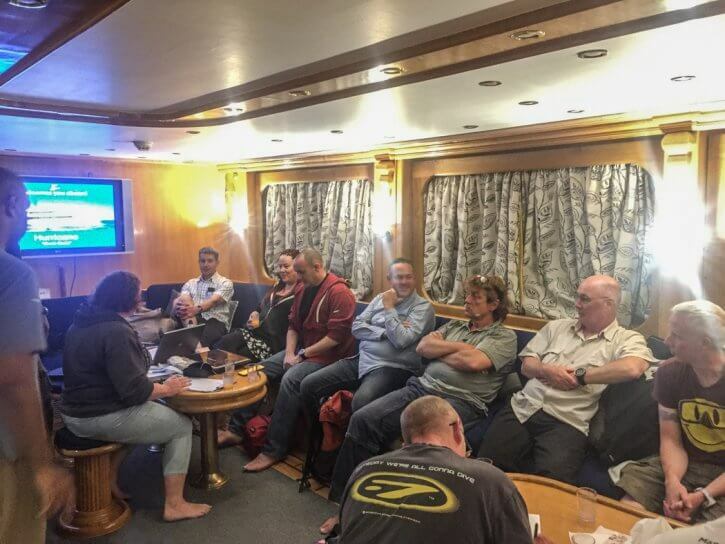 So the workshop focuses more on pre dive prep and back on board, we reviewed images and discussed different ways to approach similar situation. In evenings I gave a lecture covering techniques, composition and post-production. This really helps people know what they are going to shoot, what to expect, how to set the camera in advance and how to hone the images afterwards. One of the elements I love about teaching on these sort of trips is the creative atmosphere. There is a real buzz and people bounce off each other. I will always try to outline many of the common mistakes people make before they jump, but nothing beats the excitement of watching someone nail a shot that they couldn’t quite get right the dive before. I’d love to take all the credit, but the group dynamics really help all lift their game that extra bit. In the morning, after all the paperwork was sorted with the port authorities, we departed heading north along the coast to a site called Ras Trombi were we did our check dive. I haven’t dived this site since I was working as a guide onboard Hurricane many years ago and I was very pleasantly surprised with the quality of the reef, and the best was still to come. It was the ideal place to shake out the cobwebs and check the kit was all working properly. 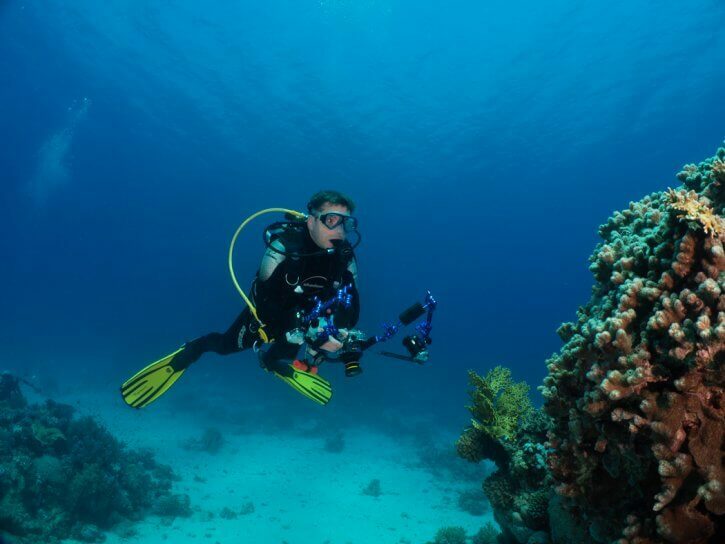 The check dive gives everyone the opportunity to refamiliarize themselves with the dive and photo equipment. After a quick chat, the group decided to skip the night dive option and head straight to the Brothers were the Yasser, our guide had had the best encounters in the last few weeks. This is the beauty of the shark quest itinerary. The guides really are the ones that know where the best sightings have been and with Shark Quest, they have the freedom to get you to the right places, without worrying about ticking off other sites, that may not be so productive. And Yasser wasn’t wrong. After a smooth crossing, we moored on the south side of Little brother and soon enough, a couple of oceanic whitetips were circling the boat. Bang! We went for our first shark dive of the week and most of us did not go deeper than 12 meters – there was really no need to. The sharks, curious in nature, came to check us out giving everyone the first chance to photograph them. The next few days were packed with action. 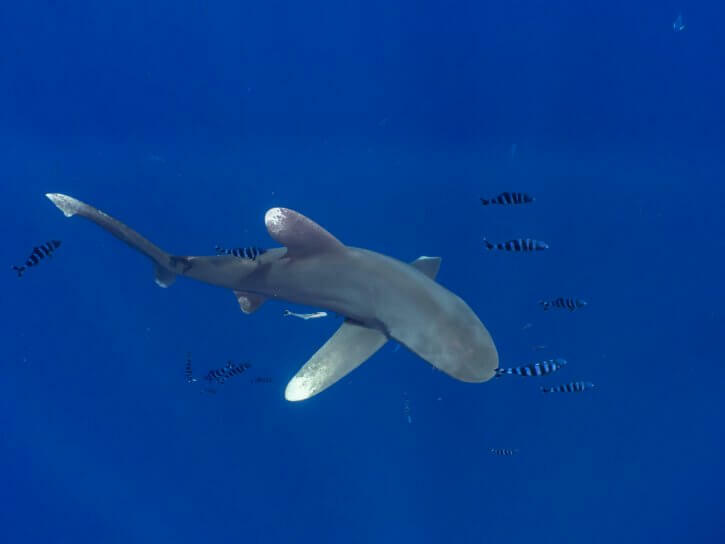 We had oceanic whitetips under the boat, grey reef along the reef walls and hammerheads in the blue, some guys even got to see a manta, a silky and even a sailfish made a short appearance. Pilot fish often surround the sharks and they make for great shots. The action was so good that we all voted to stay at The Brothers and not go to Daedalus giving everyone a bit more chances to get the perfect shot of the ever-curious longimanus. Big Brother is traditionally less “sharky” and more famous for the wrecks on the north side, but that wasn’t the case. Our first dive there was on the Numidia. 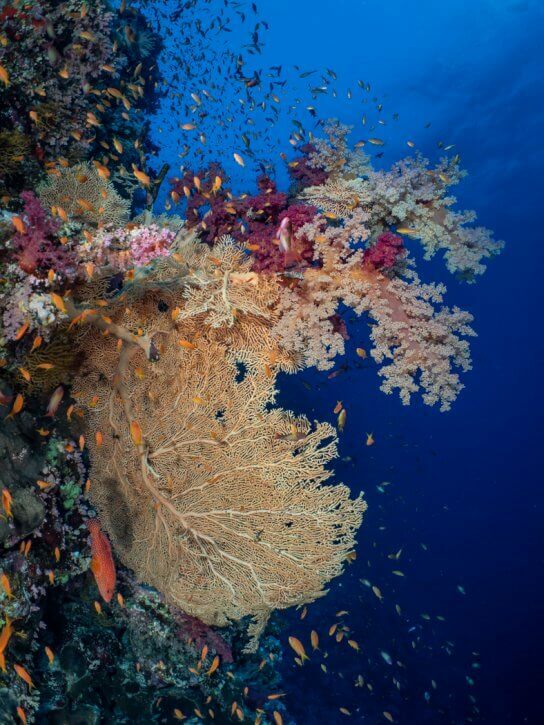 Perched on the reef on an almost vertical angle is a fantastic wreck absolutely covered in vibrant soft corals. On our way back to the boat we spotted a couple of grey reef sharks along the reef wall. Threshers are not unusual sights and we spotted one on the south plateau on our last dive of the day. These sharks tend to live in deep water and come relatively shallow to be cleaned. With their elegant tail and little mouse like faces threshers are one of my favourite sharks. On our last day at the islands, we started with a second dive on the Numidia, this time a hammerhead came close enough for a few to get a shot ot two and a thresher cruised along the wall next to the wreck. 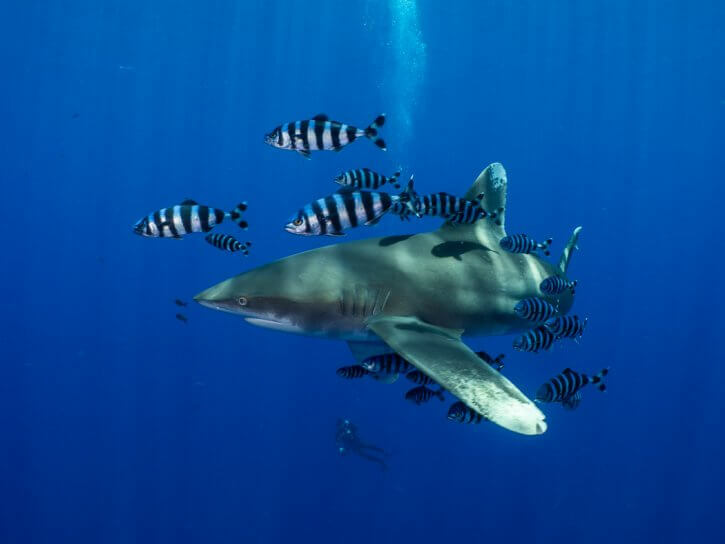 Meannwhile, for those who decided to jump from the back of the boat, the oceanic whitetips were as curious as ever making very close passes and giving everyone great poses. For the last two dives of the trip, we head closer to shore. after a very calm evening crossing, we woke up at Elphinstone where we did our first dive of the day. The corals here were gorgeous and again the oceanic showed up to wave goodbye to everyone. Our last dive of the week was at Marsa Shouna, one of the many bays in the area where a very pretty coral garden can be found in the corners while a big seagrass bed cover the centre. Some decided to stay by the coral garden and others, including myself headed to the seagrass. A huge green turtle ignored the delighted photographers too busy eating and big stingrays where the highlights. Soon all our gear was rinsed and hung to dry on the sundeck and the boat was heading back to Port Galeeb marine. Most of us spent the night onboard and the next morning after breakfast we all got taken to a nearby hotel for the day. The Scubatravel rep picked up us in the evening and took us to the airport where he was on hand assisting with the check-in process. A few hours later we touched down in Gatwick after an absolutely amazing week packed with awesome shark action, fab diving and some great new friends. Join Mario on the next “Shark Quest “ photo trip on the 22 of November to have the opportunity to photograph the inquisitive oceanic whitetip sharks of the Egyptian offshore reefs and with some luck even hammerheads and threshers.